Postfix is a commonly used MTA (Mail Transfer Agent) program that can receive, deliver or route emails. Postfix can be configured as mail forwarding domains server using virtual_alias_maps settings. The main purpose is to forward mail elsewhere. 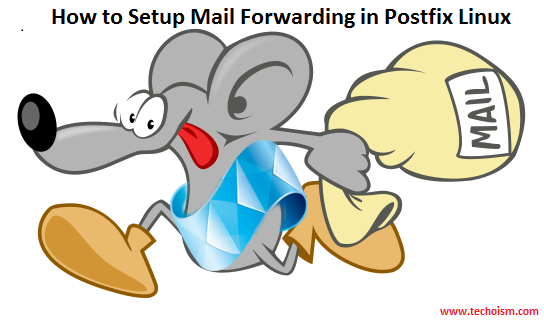 So this article shows how to setup mail forwarding on a Linux server using the postfix program. We are assuming that you have already postfix installed and configured on your system. Or you can use following commands to install Postfix on Linux. Use follwoing command to start the Postfix MTA service. By default postfix used port 25. Now verify that Postfix service is running on your system or not. Now configuring postfix to forward mails. Edit Postfix configuration file add change techoism.com and techoism.net domain names with your domain name. After making changes in configuration files make sure to restart Postfix service. Now we will add rules to forward emails to other email I’d. Let’s starts begin with the email forwarding rules. We will add rules in “/etc/postfix/virtual” file. 1) Now we will add rule to forward emails to [email protected] email account. Above rule will forward all sent emails to [email protected] & [email protected] to [email protected] account. Above rule will forward all sent emails to [email protected] to [email protected] and [email protected] accounts. 3) Now we will add rules to forward all domain email to any other emails. After entering the forwarding rules, run the following commands for the new settings to take effect. Now try sending an email to the address on your domain, and you should see the same mail forwarded to other email account.